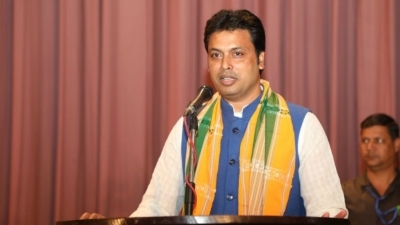 Tripura Chief Minister Biplab Kumar Deb on Wednesday visited the house of the 11-year-old child, who was murdered a day before in Bhumihin colony under Sidhai Police Station in West Tripura. Immediately after the conclusion of the day’s session in the House, the CM along with the State Education and Law Minister Ratan Lal Nath rushed to the victim’s house to meet the family members. Deb announced an ex-gratia of Rs 5 lakh for the family of the murdered child and viewed that the entire episode is part of a conspiracy organised by the drug, land and cough syrup mafias to divert the attention of the Government from the ongoing operations against them. The Chief Minister felt that the black forces are conspiring against the Government and trying to create panic across the State aiming the Government’s drive against the drug, ganja, cough syrup, land and tablet mafias. He also alleged that the Left was behind spreading the news that people were migrating to Bangladesh due to acute crisis of food, plastic flour across the State. Deb also suspected Left hand behind spreading the rumour of removal of kidneys of the murdered child. The CM also visited the trauma centre of the GB hospital to meet the injured police official in the attack by agitated locals of Shimna where the murder of the child had occurred.